What makes up a home? A loving family, friendly neighbors or peaceful surrounding? Well, these are the components that makes a home complete, but the fours walls and a roof are the components on which the very structure exists. The components of a home is the fusion of several components that comes together as a homogeneous amalgamation of design, architecture and material used. We at Vatika understand that safety comes first, hence, Lifestyle Homes renders a safe and secure environment for you and your family, while providing world class finishing for both the exterior and the interiors. Just like a tree needs a stable ground and deep roots to make its stand against the forces of nature, a house needs a strong foundation. The skeleton of Lifestyle Homes has RCC structured frame with infill brickwork designed in compliance with Seismic Zone IV that fulfills all earthquake safety requirements. Electrical and plumbing systems are the lifelines in a modern home. It is of utmost importance that these systems are of appropriate quality, so as to ensure the safety of your family against any electrical mishaps, like shocks and overloads, and damages due to water leakages etc. Hence, at Lifestyle Homes we have installed IS compliant modular switches and sockets, distribution boxes and circuit breaks from standard makes and brands. To connect all the electrical points installed throughout the house, IS compliant copper wiring in concealed conduits provides adequate safety even in times of power overload. The plumbing system makes up the important part of the building. Water leakages and flooding can have adverse impact on the home interiors, as well as raise your water bills substantially. We at Vatika understand that inner beauty is more important that outer appearances. Hence, at Lifestyle Homes we make use of quality fittings & fixtures, flooring, sanitaryware and other finishing material that brings optimal results for the interiors of your home, and stays with you for years to come. The four walls the a roof makes up a home. A firm roof over your head will protect your family from the worst of things that mother nature can throw at you, from the rains to the scorching India summers. Hence, roofs in Lifestyle Homes are built with PCC finish over suitable waterproofing and insulation treatment (COBA or equivalent). Most of the floor in the interiors of Lifestyle Homes is covered with matt finished ceramic tiles, with stain and abrasion resistant vitreous tiles in the bedroom and anti-skid ceramic tiles in the lavatories and balconies. In the common passages and staircases, polished Indian marble / Indian stone are used, that covers most of the exteriors. The ceiling finishing in Lifestyle Homes is mostly done by oil bound distemper on plaster, except for the balconies where it is done with exterior grade paint on plaster. The interior walls of Lifestyle Homes are painted with acrylic emulsion on plaster, while for the kitchen, the wall finishing is done with 2’ high ceramic dado above counter, and painted with oil bound distemper over plaster in remaining areas. The wall finishing in the toilet in Lifestyle Homes, as well as for servant quarter is done with glazed / matt finished ceramic wall tiles up to dado level (approx. 2100 mm) and the remaining is painted with oil bound distemper on plastered surface above dado level. Elsewhere, the wall finishing is done with oil bound distemper on plaster, except for the balconies where it is done with exterior grade paint on plaster. Finally, the external wall finishing which is done with external grade anti-fungal/anti-algal paint from reputed brands ensure that the exteriors of your home will render the same richness and texture throughout the years. The finishing of the main entrance door renders a sleek look with its polished hardwood frame with polished flush door shutters. The internal doors sport a painted hardwood frame with flush doors. Offering a rich and open look, the windows and external glazing has power coated aluminium frame or uPVC frame windows with clear glass. The quality of life offered at Lifestyle Homes complements the hardware used throughout the residential complex, with high quality steel/brass hardware used for locks, handles and knobs (mortise and cylindrical locks) from reputed brands. ‘Lifestyle Homes’ is a multi-storied residential housing complex in a beautiful setting of 11.55 acres* in the Vatika India Next township. The housing society located in sector-83, Gurgaon offers innovative contemporary architecture that is elegant, and yet stands out from the rest. It comprises of a variety of multi-storey buildings, from mid-rise to high-rise apartments (G+3 to G+18) that offers a panoramic view of the whole complex. 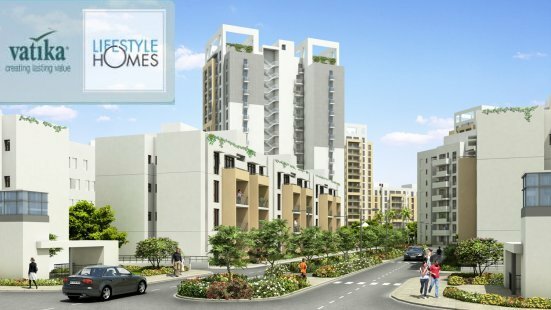 You can book a home with Lifestyle Homes in Vatika India Next township by paying 35% of the total amount in 6 months and the remaining 65% at the time of possession. This entry was posted in Residential Property in Gurgaon and tagged apartments in Gurgaon, flats in Gurgaon, luxury homes, Luxury Homes Gurgaon on April 7, 2014 by Admin.